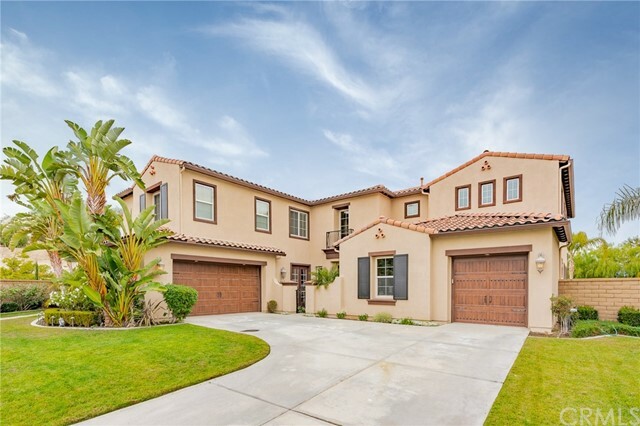 All Corona homes currently listed for sale in Corona as of 04/18/2019 are shown below. You can change the search criteria at any time by pressing the 'Change Search' button below. If you have any questions or you would like more information about any Corona homes for sale or other Corona real estate, please contact us and one of our knowledgeable Corona REALTORS® would be pleased to assist you. "Majestic custom estate located in the most prestigious area of South Corona with phenomenal views. This home has it all: 18-seat home theater, full cedar sauna, rich mahogany office, big pool, spa and children's pool, private hiking trails, huge entertainer s kitchen and even area for your own helipad. The stunning custom built kitchen comes complete with a double island, Viking stove, spacious walk in pantry, and a full butler's kitchen. There s a master suite upstairs and downstairs, both with double sided fireplaces. The living and dining rooms flank the formal entry exuding elegance from the custom moldings, marble floors and exquisite chandelier. Upstairs features a home theater and a game room/loft with a wet bar. The detached two story guest house makes for a great pool house/gym/guest quarters. The cedar sauna is nestled into the guest house with plenty of room for a yoga or massage studio. Two garages sit aside the home ready to accommodate 9 cars. The pool area comes with an outdoor fireplace, lounge and full barbecue/kitchenette with Viking appliances. This beautiful gated estate sitting atop over 10 breathtaking acres is an incredible find hidden among the hills of Corona! The house with 3 acres of land is available for $3.9M." 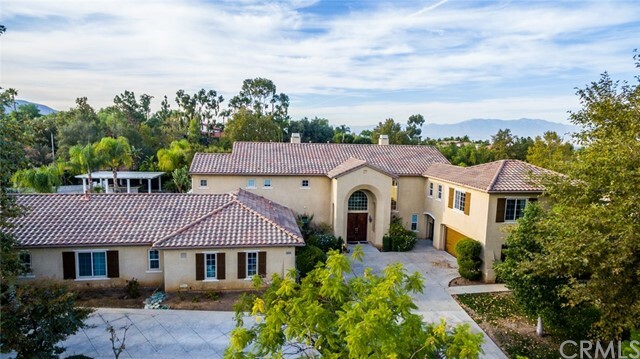 "Sprawled on a premier lot within a private gated enclave of South Corona, this masterpiece estate epitomizes splendor and luxury at each turn. Designed with intricate custom details, 1269 Amin Circle offers an elegant edge in form and function. 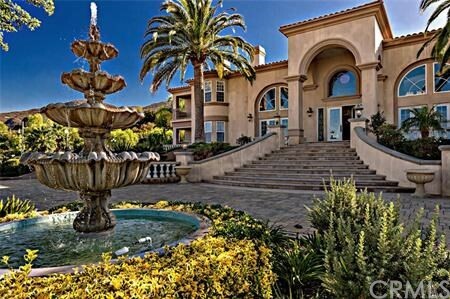 A palatial entrance with motor court and fountain greet you upon entry. The home opens with soaring ceilings and rich attention to detail throughout its 13,000 square feet of refined living space and over an acre of sprawling grounds. The property boasts an unmatched chef s kitchen, executive office, 12 seat subterranean theater, 700 bottle wine cellar, indoor pool, separate guest house with entertainment room and two oversized bars for endless entertainment. Fine finishes include rich mahogany and marble flooring, custom cabinetry and seamlessly fabricated stone. Smart-home features include surround-sound, automated LED lighting, 30 active interior and exterior security cameras, HEPA air filtration, 12 heating and air zones and a whole-home water softening system. A roasting barbecue pit, irrigated vegetable garden, duck pond and lush citrus trees await you outdoors. 1269 Amin Circle is undoubtedly one of the finest offerings within Corona and presents a rare opportunity to own a landmark address." "*Home is to be built. Note not actually built. This single story luxury home boasts well over 5000 sq ft of pure elegance. Lot #12 One of the very few remaining premium gated cul-de-sac custom home lots, is elevated lot in Renaissance Estates is ready to be built for your taste. You may alter the home to your liking and expand the living spaces. Amazing views of the Mt. Baldy and Cleveland National Forest as well as the views of the city the home is located slightly above the smog level of 1500 feet. This truly is one of the best homes within the best subdivisions in the area. The home is to be built by award winning builder and is one of the most recognized builders in the area. The gate boasts of triple cameras 24/7 yet very low HOA fee! Within the most desirable areas, the Renaissance Estates premier gated community already has a lot of buzz for being one of the best subdivisions in the area. You will absolutely fall in love with this community. Come check it out! No Mello Roos!" "Home is to be built. 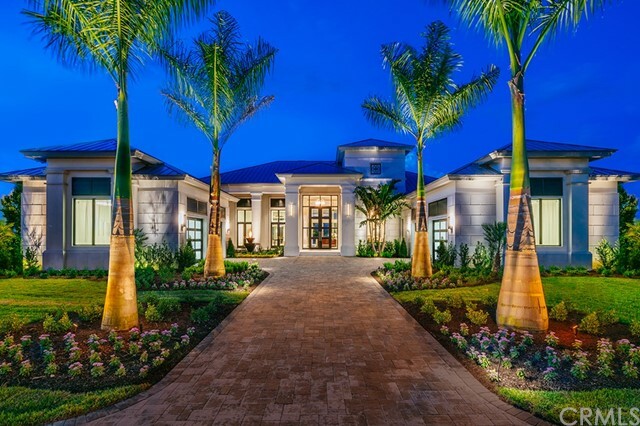 This luxury home boasts over 6500 sq ft of pure elegance. All rooms are suites and designed for perfect comfort. One of the very few remaining premium gated cul-de-sac custom home lots, Renaissance Estates is ready to build this mansion for you and you can alter the home to your liking. Most of the homes living spaces on the main level and work well long into the future (making for easier aging in place). The great room showcases disappearing walls that make the interior spaces flow out to the spacious solana and the outdoor kitchen. Every bedroom is a suite as mentioned, with the master suite boasting an impressive walk-through shower. Amazing views of the Mt. Baldy and Cleveland National Forest as well as the views of the city the home is located slightly above the smog level of 1500 feet. This truly is one of the best homes within the best subdivisions in the area. The home is to be built by award winning builder and is one of the most recognized builders in the area." "AN OPPORTUNITY OF A LIFE TIME! 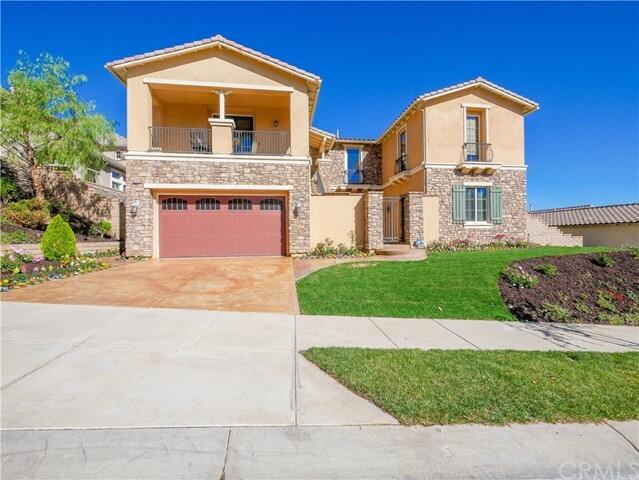 Move in to your new home in the prestigious area of South Corona at Garretson Ave. 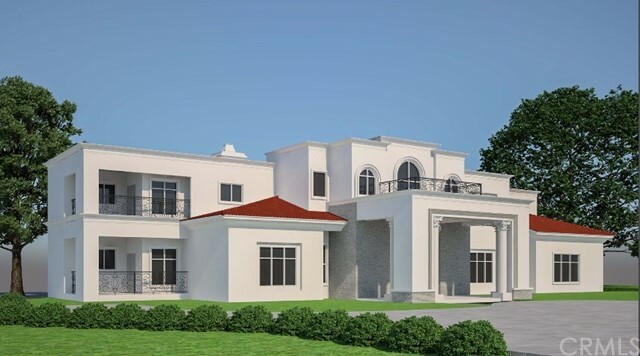 This new home will reflect sophistication, elegance, and it will be rich in character. The home will sit in over an acre of flat land, where the buyer will have the option to pick a layout of 6,000 sq ft or 8,000 sq ft and be able to customize many details to their own taste in their future home." "Custom built estate in the South Corona. 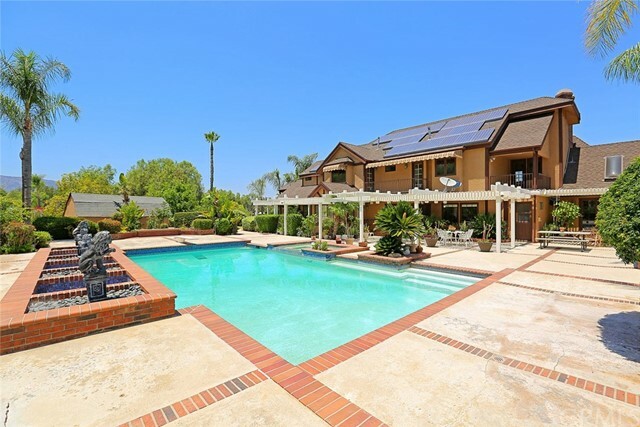 This property has 5 Bedrooms/8 Baths with 8,032 sqft of living space on over 1 acre of land. The grand entrance features high ceilings with beautifully positioned chandeliers and breathtaking floors. All bedrooms are equipped with on suites. The master bedroom has views overlooking the custom-built pool, putting green and the glistening city lights. Featuring a double sided fireplace, spacious seating area, large walk-in closet, jetted tub, and its own entrance into the fully equipped gym, you are certain to feel like royalty in this master retreat. Upstairs also has it's very own theatre. Downstairs provides, in-law suite, control 4 smart system, game room, 2 offices,formal dining room, wine cellar, Butler's pantry, laundry room and much more! The immense custom kitchen comes with stainless steel appliances, breakfast nook, island that opens up to the family room accommodated with a fireplace that is perfectly designed for entertainment." "Estate living at its best! The freedom and fresh air of wide-open spaces. Stunning custom-built 4,839 square foot gated-estate on 5-acre corner-lot with seven other 5-acre custom-built homes on same street. Highly desirable location at foot of beautiful mountains to the south with spectacular view of city lights to the north. Swimming pool, tennis court, granite counter tops, water well, solar panels, two staircases, and much much more. Must see to appreciate. Buyer to verify and investigate square footage of the property." "VALUE IN LAND!! There is a final map (in supplements) and seller owns 108 lots totaling 8.72 acres however in the Wildwood Glen Cabin Sites final map dated 1924 there are approximately 250 lots. Owners of the balance of these lots would all like to sell, some listed some not. The city recognizes the project and the fact that all streets shown are dedicated however they do not want the project built as the neighborhood is now zoned 5 acre minimums. The homes around it are mostly in the $2,000,000 plus range. The city would like to negotiate a much lower density. The city said they would not allow anything built to cover 2 lots or more, it would have to be built so that no structure would cross a property line, no exceptions however there are two homes built on the entire project, one on my sellers property over 20 years ago with no concern to the Wildwood Glen Cabin Sites lot lines what so ever. I wouldn't place any value on the structure however certainly livable. There is also another structure built that covers the Wildwood Glen Cabin Sites which is not owned by my seller which also has no regard to lot lines. You will notice a single lot in the middle of my seller's 108 lots that has a different owner. This was purchased at a tax sale years ago and I have it listed for a ridiculous amount but that is included in the $2,250,000 price." "Elevate your living/lifestyle & welcome to your new home. Located in the highly desirable exclusive community of Seven Oaks, luxury estates. Property is located in a gated community offering 7,125sqft, 8 bedrooms, 6 bathrooms, bonus movie theater room w/custom surround sound, office w/french doors leading to the resort style back yard. Lot offers 1 acre of flat usable land. Main level offers living room w/fire place, formal dining room, kitchen offers dual oven, granite counter tops, large walk in pantry, breakfast nook, large island, bar style seating w/an open floor plan leading into the family room. Main levels western wing offers custom movie theater room, large office, laundry room which leads into the first 2 car garage. Eastern wing offers 1 full bedroom with private bathroom, large bedroom and entry into the second 2 car garage. Ascending to the second level, master retreat offers significant amount of space, fire place, large master bathroom, his and her sink, massive walk in closet spectacular views of your breathtaking oasis of a backyard. Second level also offers 5 large bedrooms 3 full bathrooms, loft and built in cabinets and study area. Rear landscaping of this estate is breathtaking. Wrap around alumawood covered patio, large pool, spa, built in barbecue area offering gas, water and electricity. Birds of paradise, queen palms, beautiful vegetation and vines surround the landscape offers tranquility at home. Detached pool house, fenced dog area and flat land." "***2 Custom built Exclusive home on a lot ***This stunning property has 2 SEPARATE COMPLETE HOUSES on 2.29 acre FLAT and USABLE LOT. 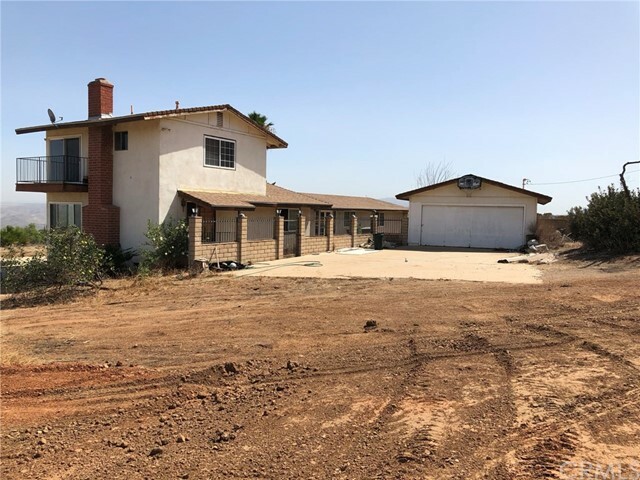 situated in the most sought after area in Corona with unlimited potential possibility of to further sub-divide.Per seller can built one more home. Perfect for this multiple generation family or RENTAL INCOME at your own back yard.The main house boasts 4 bedrooms 3.5 baths, 3646 sf living space, 2 MASTER suite with gourmet chef's Kitchen , stainless steel appliances. Attached new built in (2017) 12 CAR GARAGE which has 2460 sf can convert part of it as a EXERCISE room. The SECOND BRAND NEW HOME was built in 2018 with 2460sf. consist of 4 bedrooms ,3 full baths with travertine tile throughout. Granite counter tops with huge island. Brand new 1800 sf FRONT PATIO has covered and 8 CARPORT parking possible . Outside , Approximately 58,000 sf of open land is available for landing /take off the future flying car , taxi & Drone taxi or 2 to 3 RV parking lot or Multiple other uses. There are 145 avocado tress that have generated income plus 15 Lemon tress and 15 mature others. 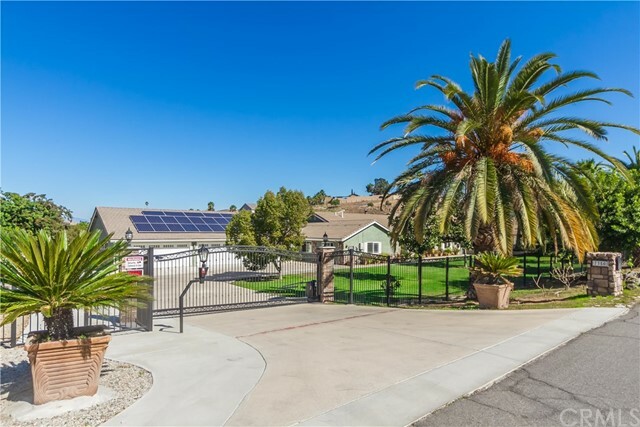 Added bonus of a 25 gallons WELL per minute(Seller says no pay water bill) and has serviced by 45 solar panels that are paid for and generate credit , Private custom Iron front gate fence with powered opener, dial pad telecom/video screen , CCTV. Close great schools, Shops and 15 FWY. you must see to appreciate this one of a kind estate,"
"Exquisite Spanish/Mediterranean Gated Estate, Turret w/circular stairway, Main home with 5 bedrooms, 5.5 baths, central air/heating, 10 ft interior ceilings. Guest home w/1 bedroom, 3/4 bath, vaulted ceiling multipurpose room/game room, steam sauna, wet bar, french double doors, hardwood/natural stone flooring, wood shutters, ceiling fans, media closet, laundry closet, canopy. Stucco exterior, Spanish tile roof, wrought iron detailing, water fountain. Security Gate with Block Wall and Wrought Iron fencing with additional Gate entry porte cochere, 4 car garage, direct access to kitchen, pantry and laundry room. Double door entry foyer to interior of home w/interior patio with fireplace. Formal living room, fireplace, formal dining room, open gourmet kitchen. Upscale appliances: Range, oven, microwave, breakfast bar/kitchen Island with sink, granite counter tops. Main floor bedroom w/ 3/4 bath, 1/2 guest bath, large Family room, Master Bedroom Suite with private retreat and small private patios. Master bath w/spa shower, large jetted tub, walk-in closets. 3 additional bedrooms with own baths. Wood flooring and Custom Stone flooring, and carpeting throughout 2nd floor. Ceiling fans, wood shutters, music/cable, t.v. connectivity, camera/alarm system, LED lighting, solar system, water softener. 3 Lanai patios, salt water pool, fire torches, 10 person spa, fireplace, separate lanai w/bar and sink, pizza oven, Lynx BBQ grill/burners. No HOA, No Mello Roos." "Located in the premiere community of The Retreat at the end of a cul-de-sac and nestled on over an acre of flat, usable space with views, this home has it all! Featuring 6 bedrooms, 5 1/2 bathrooms plus HUGE bonus room this home is truly model perfect! The courtyard leads to a custom front door and as you enter the home you will see the soaring high ceiling and a open floor plan. The family room is large with recessed can lighting, wood beam ceilings and gorgeous crown moulding.The kitchen is large and spacious complete with a veggie sink, butlers pantry, walk-in pantry, large built-in stainless steel refrigerator, commercial style gas cooktop, large commercial vent hood with venting to the outside, and enough bar sitting for 5 barstools. There are custom built-ins in the home, and an AMAZING movie theatre room which includes the projector, screen, speakers and seating. All secondary bedrooms are large and spacious. You also get a large bonus room, that can be used as a game room and a separate office with double glass doors with a Murphy bed that completes this amazing floor plan.There are 2 laundry rooms even! Into the backyard you will find outdoor living at its finest with a huge cascading salt water pool/spa and waterfalls, built-in BBQ area and a ton of privacy! There is also an outdoor fireplace and plenty of open grass space to add any other outdoor activity. There is even a dog area with their own private doggy pool! This home is a must see!" "This stunning Spanish Colonial custom home will leave you breathless. When you drive up, you will know that there is just that extra special something about this home. You have entered a private oasis that has caressed the natural beauty of the surroundings. Remodeled approximately 10 years ago with attention to detail for both beauty and functionality. Step inside to your dream home and just start to feel that you have arrived. Exquisite interiors include, every home chef s dream kitchen with custom designed cabinetry, even the Sub Zero refrigerator has a custom cabinet. Within the kitchen there is a Viking stove with 2 ovens, also a Warmer and a Microwave and a Farmhouse Sink. The kitchen pantry has a magnetic chalk door and when you open up the pantry the automatic light comes on. The Kitchen table looks out onto a relaxing patio to enjoy your morning coffee or tea. Almost every door in the house looks out onto the expansive lush backyard patio and loggia with views of the pool, spa, grove and hills. This home is the perfect setting for entertaining. When opening the doors to the backyard, courtyard and loggia it gives you an open expansive area to serve your guests or host a family gathering. The Master Bedroom Suite has a patio, custom walk-in closet, large bathroom, steam shower and spectacular oval bathtub. Needless to say, this home is absolutely gorgeous! It is really hard to show the true quality of this home in pictures, a preview is a must. *Upgrade list avail." "TWO HOUSES ON LOT ....Amberhill Estate home in South Corona WITH GUEST HOUSE 5,242 main house sq ft, and approx 1,400 sq ft guest house with separate storage unit. Over half an acre resort-like, private lot which features custom pool and spa w/waterfalls, outdoor fireplace and patio, built-in BBQ island and pizza oven * putting green * koi pond with waterfalls * OWNED solar system for entire house and yard, NOT LEASED * Main house has grand foyer entry, custom built-in library bookcases and desk, cofferred ceilings, elegant custom fireplaces with mantels in formal living room and great room * crown molding * custom paint & tile * Chef s enormous kitchen with granite and tumbled marble. Expansive great room with wet bar * Master suite with retreat. Jack & Jill bedrooms * Two bedrooms with on-suite bathrooms * Large indoor laundry room with refrigerator hook-up. * Guest house features double-door entry, two bedrooms, separate living room, kitchenette, office and sound studio. NO HOA. Close to shopping & easy freeway access to Orange, Riverside or LA Counties. * MUST SEE, BEAUTIFUL HOME AND PROPERTY!" "Secluded cul-de-sac lot in the gated Crown Ranch community. Magnificent Corona estate features fine craftsmanship, tasteful fixtures and finishes with Spanish-style stone and stucco architecture. Approx. 5401 sq. ft. Top of the line material which includes 5 bedrooms and 5.5 bathrooms. Spacious master suite has balcony, retreat with fireplace, plus a walk-in closet, two vanities, huge shower and deep tub. Guest bedrooms have walk-in closets and en suite baths. Foyer with curving staircase; formal living room with fireplace and beamed ceiling; French doors in the dining room open to dining patio with fireplace. Huge family room with wine storage room, entertainment center, 2nd staircase, and view of the pool and spa; French doors open to shady terrace. Chef s kitchen features limestone floors, custom cabinetry, granite counters and huge center island; double ovens, built-in refrigerator, and 5-burner gas cooktop with custom range hood; butler s / walk-in pantry, and breakfast nook. Home office/5th bedroom, huge loft/bonus room, study alcove, full-size laundry room. Stone and hardwood floors throughout.Venetian Walls & Ceilings. Gorgeous pool and spa, 2-level pool deck, large poolside pavilion with bar seating, kitchen area, fireplace, and BBQ. Approx. 3/4-acre estate includes park-like grounds, front courtyard, a fountain, raised stone planters, mature landscaping, and a long stone driveway. 4-car garage." 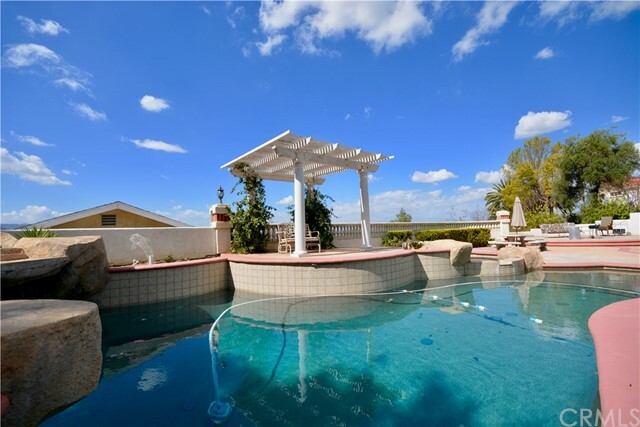 "If your'e looking for an stunning, expansive single story view and pool home with complete privacy look no further! There is a feeling you have when you get here, and when you get here you will know what I mean. It's special! Welcome to The Pinnacle! An Amberhill community nestled in the foothills of the Cleveland National forest and above the city of Corona. 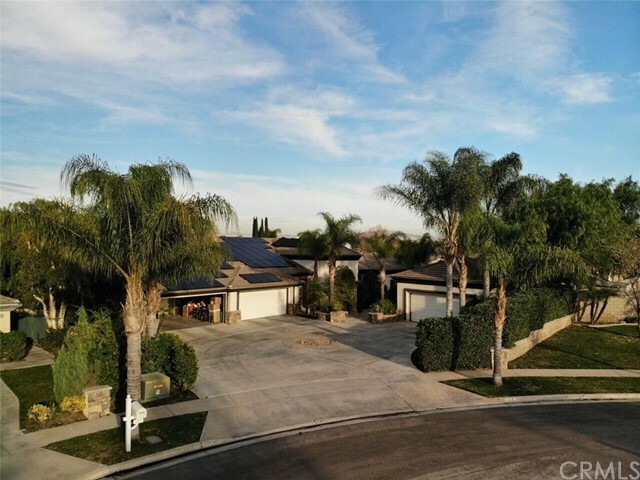 When you arrive you will see a beautiful, sprawling home with fresh exterior paint, a circular driveway, beautiful landscape and hardscape, and a 4 car garage. This expansive semi-custom single story estate home is filled with all the desirable amenities to make an entertainer's dreams come true. The massive lot of nearly an acre is a showcase of incredible panoramic views, a sparkling pebble tech and flagstone salt pool and spa with relaxing water features and decking, a sport court for basketball and volleyball, covered built-in barbecue area with seated bar, a playground for the little ones, lush landscaping, and plenty of extra space to spread out! Enjoy complete privacy and incredible views from this elevated corner lot of a cul-de-sac street with no neighbor behind, across the street, or on one side! The floor plan allows you to really spread out! The interior features wood floors, wood shutters throughout, lots of windows to let in natural light, 14' ceilings, crown molding, master suite with retreat, huge master closet, and a very cozy feel. This is truly a special place!" "Gorgeous Gated Estate in Corona. Enter through the automatic gate to the over 40,000 sq ft lot and enjoy a true Sense of Privacy. This Highly Upgraded Home, Features 5 Bedrooms & 4 Bathrooms + Game Room with Wet Bar. It is Beautifully Appointed Throughout, Including: Dual-Zone Central A/C, Dual Pane Windows, Beautiful Trayed Ceilings, French Doors, Custom Blinds, Recessed Lighting, Extensive Chair Railing, Custom Flooring, Raised Panel Doors & Large Pillars. Step Inside this Gorgeous Home with an Elegant Formal Living Room & Dining Room. It Boasts a Gourmet Kitchen that Includes Center Island with Seating, Granite Countertops, 2 Sinks & Appliances (Double Oven, Built-in Microwave, Dishwasher & Gas Cooktop) and Built-in Desk. The Kitchen is Open to a Large Inviting Family Room with Breakfast Dining Area and 2-Sided Fireplace. Breathtaking Master Suite with Fireplace, Giant Walk-In Closet with custom Built-in Shelving & Luxurious Spa-Style Bathroom with Spa Tub, Separate Shower, His & Hers Vanities and Sit-Down Make-Up Bar. The large Indoor Laundry Room has ample Cabinets and a utility sink. The Backyard has over $200,000 in Custom Hardscape & Professional Landscaping. Stunning Entertainer's Backyard features a Sparkling Pool with Rock Waterfall and Spa. There is also an oversized 4-car Garage. The property is fully fenced and has a automatic gate along with a circular driveway. You must see this unbelievable property to appreciate, as it is truly amazing inside & out." "Welcome to the house of your dreams! This amazing colonial style estate sits in the hills of Corona near iconic places such as Tom's Farms and Glen Ivy Hot Springs. As you enter the private gate you will find a driveway surrounded by oak and fruit trees and the drive way that wraps around a beautiful fountain. As you enter the double door you will encounter a gorgeous foyer, wooden stairway and a mudroom across the hall. To the right you will find the formal dining with a beautiful vintage chandelier and custom crown moldings. As you continue on you will find the large kitchen area with custom ceiling wooden beams, recessed lighting, accent brick wall, granite countertops and tile flooring to entertain your friends and loved ones for days on end! You'll also find a family room with fireplace next to the kitchen and on the other side of the Foyer you will find the formal living room with a fireplace and large windows that let in the natural light. There is a full master bedroom downstairs with a full bathroom. This property features an underground theater with a projection TV and wet bar area, a large loft on the third floor and a second floor with a full master bedroom and bathroom, three additional bedrooms, two bathrooms and a den area. There is too much to mention! The beautiful panoramic views with amazing sunsets will take your breath away. Including are stables for 7 horses, pool, horse arena, solar panels and a large lot. Come see for yourself! Don't miss out!" "Almost never lived in estate home in the Retreat - the Inland Empire's premiere 24-hour manned gated community. At over 5,300sqft this is one of the biggest models in the community. 5 Bedrooms, 5 Bathrooms, plus a Loft & a Theater room. Sweeping Mountain and City Light Views. No neighbors behind you. Enter through private gated courtyard to soaring high volume ceilings and rod iron staircase. Large kitchen island, 2 pantries, upgraded stove and breakfast nook. Formal dinning room, formal living room, and large family room w/fireplace. Private downstairs guest quarters with it's own bath. Lots of Crown Molding, custom chandeliers, custom stone flooring throughout. Romantic Master Suite with fireplace and expansive balcony overlooking the view. Large private Casita with its own entryway and its own private balcony." "Looking for PRIVACY and TRANQUILITY? You have arrived! 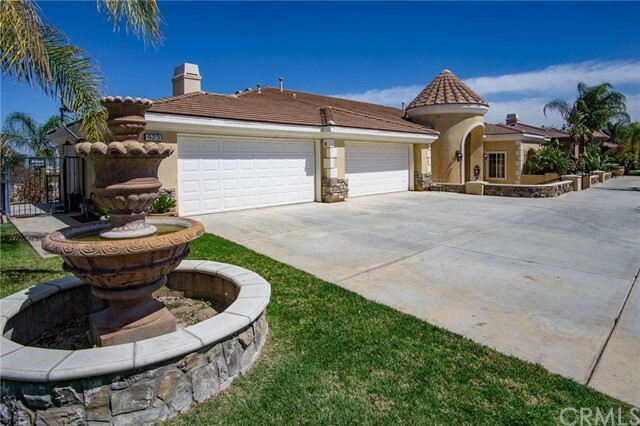 Enter thru the Crown Ranch gated community, this corner lot luxury home is any homeowners dream. Features: Dual entrance door of the house welcoming you to the formal living room (on the left) with a fireplace, and formal dining room (on the right). The over sized chef's delight kitchen that has a center island & upgraded built in appliances connected with a beautiful arch to this hall way. The kitchen flows nicely into the family dinning and living rooms which hosts double French sliding windows leading completely open to bring the outside in, creating the ideal flow for indoor/outdoor SoCal living. Back yard is outstanding. This over-sized yard offers the ultimate in privacy, large covered gazebo provides shade, and a glistening pool and spa provide a tranquil environment. The second level provides a grand master suite including fireplace, seating area, and private balcony with panoramic views to enjoy your morning coffee surrounded by the splendor. The adjoining master bath, walk-in closet, dual vanities, open shower, and separate soaking tub to take in the gorgeous views and natural light. The home features three additional ensuite bedrooms, a loft and built in desk gives a separate bonus space for a craft or kids play. 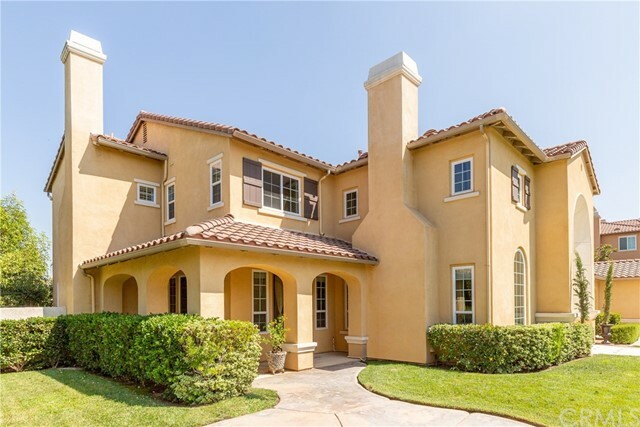 Incredible exterior curb appeal, with porte corche driveway and over-sized 4 car garage.premium lot location with nobody behind.This Spanish Mediterranean Estate is even more amazing in person." 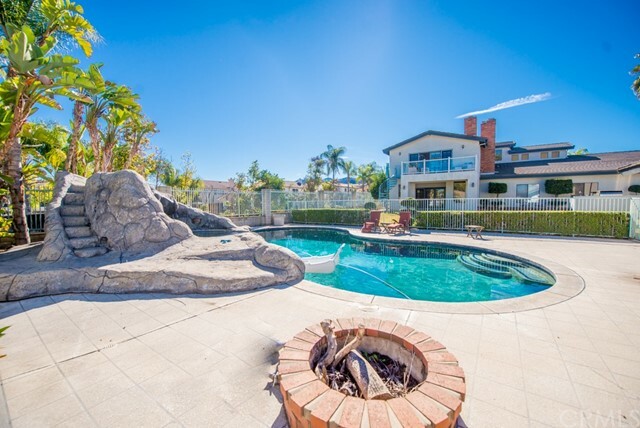 "Incredible opportunity to own a pool home that can give you instant equity in highly sought after Weirick Canyon in South Corona with Panoramic views of the Cleveland National Forest and the valleys all around. You can't beat this location, just a couple of minutes from the freeway and Dos Lagos shopping. Massive covered back patio for loads of outdoor living space to take in the views and the privacy. Steps down to the pool entertaining area with waterfall, gazebo, fire pit and room for everyone you can think to invite! Fully paid for solar provides you free electricity!! Inside 5 bedrooms, all with en-suite bathrooms, including master suite with fireplace, wetbar and access to the covered patio. Home is light and airy with high ceilings, lots of windows and skylights. Dramatic entry to the foyer with high celings, and to the living and dining rooms with barrel vaulted ceiling. Large kitchen with walk in pantry, center island and informal dining open up to the massive family room with fireplace. From the family room, stairway to the bonus room above the garage perfect for guest room, game room, office or home theater. Perfect floor plan, lots of square footage and an incredible location that just cannot be replicated. All price hundreds of thousands below comparable homes, so that with some modernizing, will give the new owner loads of equity. The possibilities are endless." 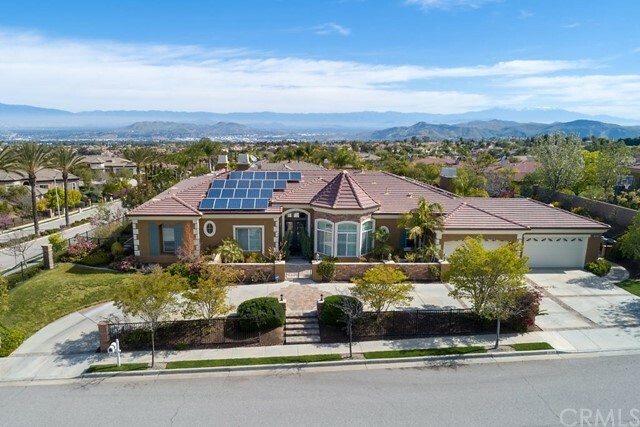 "Stunning Single Story Estate Home, with 5,242 sq ft in the Prestigious Amberhill Estate Community in South Corona, is loaded with designer upgrades, with Amazing Panoramic Mountain, City Lights and Hills, you will find it very private in a Cul-De-Sac entertainer's dream home. With a 4 car garage and a large driveway in the side with room for your toys, cars, RV and more. The Grand Entry is arched with roman columns, double beveled glass doors and medallion marble floor inset that will leave you breathless with that reach over 12' feet with Roman columns, Separate Formal Living and Dining room with elevated fireplace, Take advantage of the completely private office, gym, or music room with double glass doors that takes you into your storybook backyard. Includes wet bar with granite counters next to the Family room to enjoy with friends and family. The gourmet kitchen is highlighted by a large island, granite counters, custom back splash and stainless steel appliances, including a six-burner stove, oven and a dishwasher, Main Suite is wonderfully generous in size with additional retrieve to enjoy with your love one, next to the fireplace in a romantic night. The Main en-Suite has substantially sized double headed shower with seating area, jetted soaking tub, and enormous walk-in closet, 3 bedrooms with its own bathrooms and 2 bedrooms share a Jack-n-Jill bathroom. It offers a Huge Lot with a Storage Unit with electricity, well design landscaping with Endless Possibilities!" 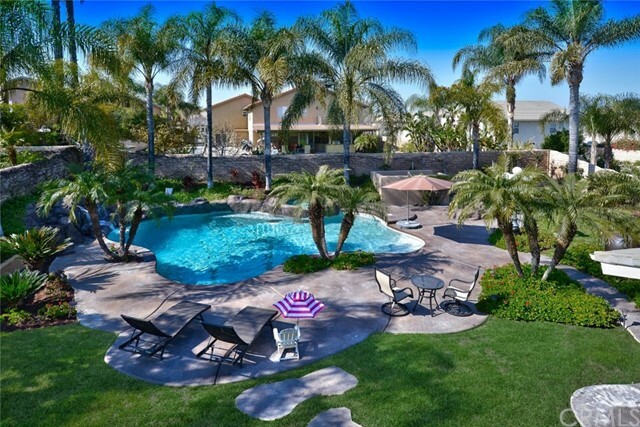 "Private and secluded, entertainers home located in a sought-after enclave of Corona. This unique property was built for comfort, enjoyment, privacy! Upon entering the property through the deep and gated driveway you come across the pool room, complete with a open game room, bathroom, fireplace, laundry area and kitchen. Which can be used as a private sleeping quarters, media room, man cave or workshop. Bask in the sunshine while playing/exercising in the custom built swimming pool and enjoying the water slide, spa and BBQ area. **Two** of the 5 expansive bedrooms are Master Bedrooms with their own private bathroom, large walk in closets and a fireplace, one of the master bedrooms includes a balcony, and the other has a private patio to lounge and enjoy your favorite beverage while admiring the relaxing view overlooking sparkling city lights, swimming pool and snow-capped mountains. The completely remodeled kitchen is a chef's delight featuring a pantry, island and breakfast area. Enjoy delicious meals with family and guests in the impressively huge formal dining room. Adjacent to to the dining room is the spacious and accommodating family room which includes a warm and inviting fireplace. Other amenities, Jack & Jill bedrooms, laundry room, 3 car garage with direct access. low maintenance yard with drought tolerant plants. The home sits on 1.15 acres and is surrounded by fruit and mature avocado trees. It s a must see." "This amazing Amberhill home is an ENTERTAINERS DREAM! This tropical paradise features a salt water pool with slide, waterfall & spa plus an outdoor kitchen w/built-in BBQ, side burner, sink, & counter/bar/seating, fire-pit, covered patio, & two grass areas. Inside is a chefs kitchen featuring a large island w/raw cut granite counters, built in refrigerator, custom lighted cabinetry, stacked rock walls, high end appliances & copper accents throughout. The eat-in kitchen is big enough for a table of 8 or more! Just off the kitchen is a cozy sitting area with a fireplace & window seating, just perfect for quiet conversations with family and friends. The large family room features hardwood flooring, fireplace, refrigerated wine cellar, & its own private guest bathroom. If this weren t enough, enter through the double french doors to a separate & MASSIVE game room with built in bar...so large that it houses a pool table (included with the sale), & a large sectional sofa! The lower level also features a private office with a granite desk, custom cabinetry, & double glass french doors. The living & dining rooms have vaulted ceilings showcasing a beautiful spiral staircase. There are two laundry rooms (one up & one downstairs) & dual staircases. The second floor features four bedrooms with Jack-n-Jill bathrooms, an open gym area with a full bathroom, large master en-suite with fireplace, walk in closet, & direct access to a wonderful balcony to enjoy beautiful sunset views! Low Tax"